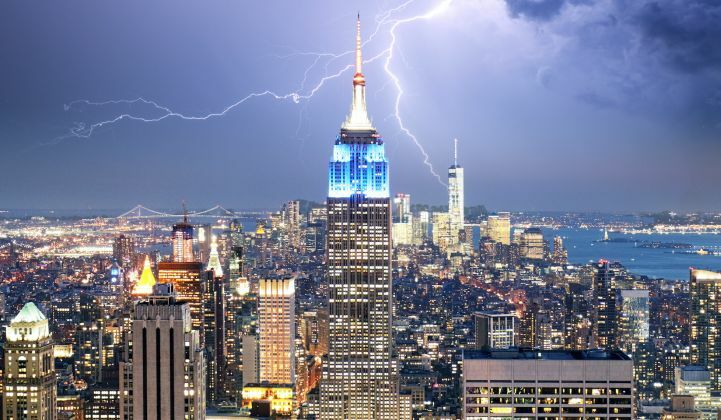 New York’s Reforming the Energy Vision initiative, a grand overhaul of utility and energy regulations to enable distributed energy, hasn’t yet opened the floodgates of private investment. But REV has allowed the state’s utilities to rate-base a significant number of investments, largely through non-wires alternatives. Meanwhile, the latest REV ruling includes utility-suggested metrics for the value of distributed energy resources that solar advocates say could undercut the value of community solar, energy storage and other third-party DERs in years to come. New York’s Public Service Commission is being flooded with filings from utilities, energy groups and consumer advocates as it takes on the task of cleaning up these utility proposals in advance of a November deadline. That’s the state of play at Greentech Media’s New York REV Future 2017 conference. You can watch the livestream here. During a Tuesday morning panel, GTM's Katie Tweed asked a group of New York utility, regulatory and energy industry executives to take on these points of conflict in REV’s multi-path push toward creating a market that can reward DERs across several “stacks,” from providing system-wide energy to supplanting local grid investment. But at least for now, “We’re not there yet, and there’s more work to be done," said Glass. Rate-based utility projects, in the form of the non-wires alternatives like Con Edison’s Brooklyn-Queens Demand Management project, are taking off, he said. That’s good for the third-party DER providers that win contracts -- but it doesn’t help solve their fundamental problem, which is revenue certainty. In fact, third-party DER developers are facing a more uncertain future under the latest version of REV dealing with the value of distributed energy resources (VDER), he said. That’s largely because VDER is meant to replace an existing revenue stream for solar developers -- New York’s long-standing net energy metering regime -- with a far less clear payment, he said. This conflict came to a head earlier this month, when the New York Public Service Commission (PSC) approved a REV Phase 1 ruling that retained a set of utility methodologies and metrics for marginal cost of service (MCOS) and other distributed energy valuations that solar groups have been complaining about for months. The Natural Resources Defense Council, the Solar Energy Industries Association, Vote Solar and the Acadia Center pointed out that utilities had wildly different values for per kilowatt-hour MCOS, from $226 for Con Edison to $15 for Central Hudson. These figures also lowball the value in grid support and capacity to be provided by community solar -- the main set of solar projects that would fall under the new VDER regime in the short term. Meanwhile, the PSC’s order also allows for VDER to be revisited every three years, opening the possibility that a solar project’s value today could be very different three years from now. As Glass summarized, “we’re not yet getting the type of certainty or revenue stream that will enable us to use someone else’s money,” he said. “One of the biggest challenges is how to sequence and prioritize,” he added. REV’s work encompasses everything from the smart meters just now starting to be deployed by big utilities, to the state’s goal of getting 50 percent of energy from carbon-neutral resources by 2030. The linkage between utility MCOS values and eventual VDER payments is a tortuous one, running through calculations of systemwide demand reduction value and locational system relief value, and is still subject to refinement, Weiner noted. Meanwhile, REV is taking big strides in non-wires alternatives, which “three years ago seemed like a wild and crazy idea, but has really become the order of the day,” Weiner said. Glass also highlighted what he called the state’s lack of clarity on energy storage policy. “As long as storage is left out of the conversation, we’re not going to get to a more sophisticated stack” of values available to DERs, like fast-responding grid support, he said. “Can we talk you into having some storage targets on a utility-by-utility basis?” Glass asked -- a nod to the uncertain future of a statewide energy storage mandate bill on Gov. Andrew Cuomo’s desk. “You never know,” Weiner said.